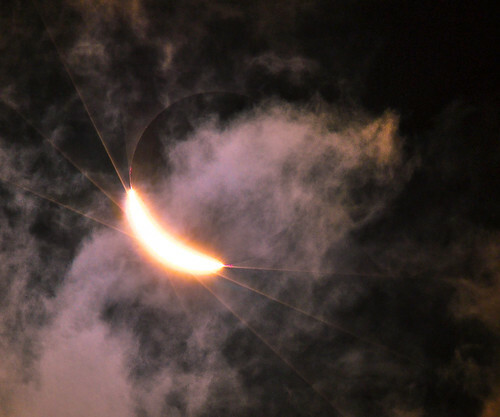 Solar Eclipse in Tahiti, July, 11 2010, originally uploaded by Pierre Lesage. Football worldcup started at 08:30 AM - a busy morning indeed. At 99,6% totality, I took the max densirty neutral filter out to discover the famous "diamond ring"
Totality was not complete on the island of Tahiti and we could not observe the Baily's beads or the corona, but a few atolls in the Tuamotus archipelago had up to 4 minutes 100 % totality.